Due to special event, J-Garden was only serves buffet dinner for 30th and 31st of October only. A la carte menu wasn't available during the period. I kinda like all the simple green decorations around the restaurant, it makes you feel relax and healthy while dining at the restaurant. The restaurant itself is rather spacious and can accommodate up to 100 pax including indoor and outdoor seats. They can also host private parties or gatherings for celebrations or special occasions. The restaurant was decorated with some creepy stuff due to celebrations of Halloween event. They are kinda creative with some arts and crafts deco in the restaurant too. 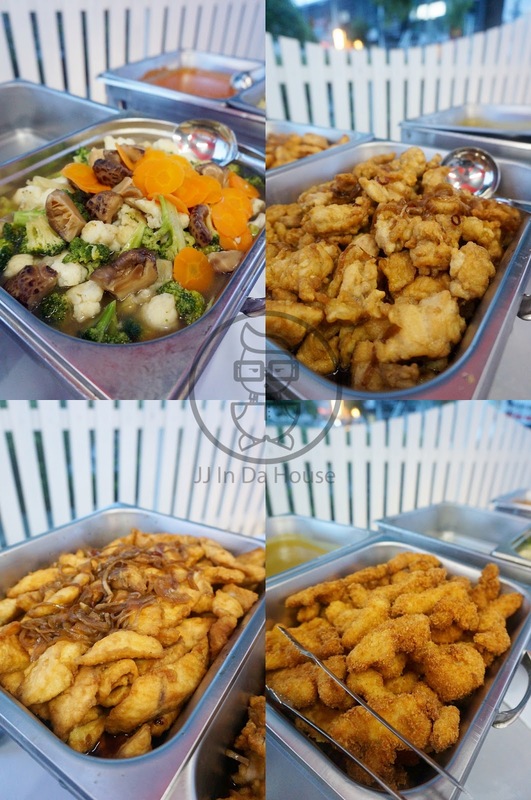 Celebrating special event, J-Garden prepared quite a number of dishes for all the guests. Talks about quality, you can also judge from the look of its food. From appetizer like this you can even see caviar from its canape food. Picture shown is biscuit topped with egg mayo and caviar. 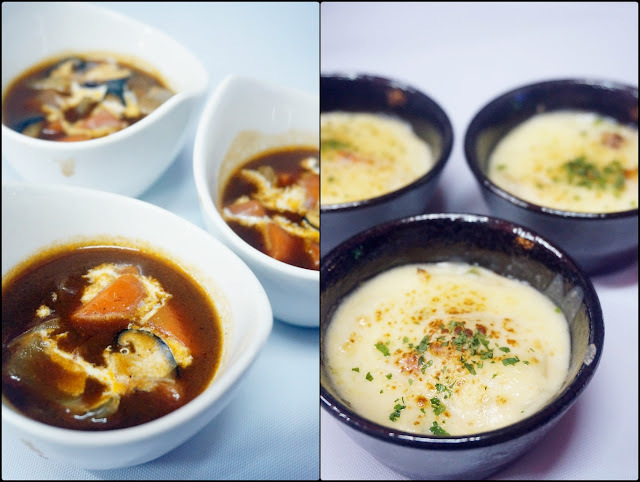 Their cuisines are kinda special with combinations of Japanese and Western cuisine. They also provided salad cups with different dressing, my favourite would be the signature Japanese sesame dressing! Spicy Pumpkin Soup was kinda special. It was my first time to try hot pumpkin soup and I was totally surprised by it. The soup was quite smooth and the taste of pumpkin was kinda rich with a hint of curry. Seasonal Vegetables, Fried Fish & Chicken in Special Sauce and Fried Fish in Japanese Curry. The special sauce was kinda appetizing and made us want to have it with rice. Japanese Curry is my all time favourite Japanese food. I kinda like the Japanese Curry they served here as it was kinda flavorful and tasted just perfect for my liking. I took another bowl of rice just to go with the curry. Being Japanese's Western cuisine, J-Garden also serves Spaghetti with Tomato Sauce to their guests. This dish is usually available on their a la carte menu too. They also have action stalls set up to prepare food freshly for all the customers. There were Teriyaki & Teppanyaki station, Tempura station and Grilling station. There were these small delicacies, one was with beef so I didn't try it, but the other one was some cheese baked mixed seafood that tasted kinda cheesy and delicious! Some delicious Seafood Teriyaki Sticks cooking on the hot pan with Teriyaki sause. There were salmon, capsicums, onions and scallops on the sticks. All were served fresh. One of the Japanese chef preparing Tempura dishes. Tempura prawns, pumpkins, eggplants and mushrooms served hot and crispy. 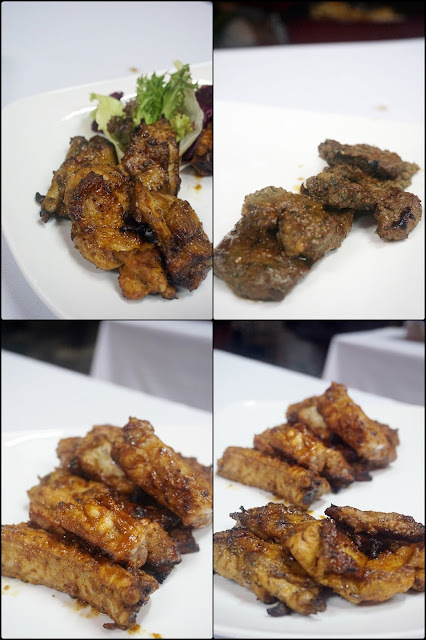 The grilling station prepares J-Garden signature dishes, the BBQ pork ribs, lamb, beef and chicken. 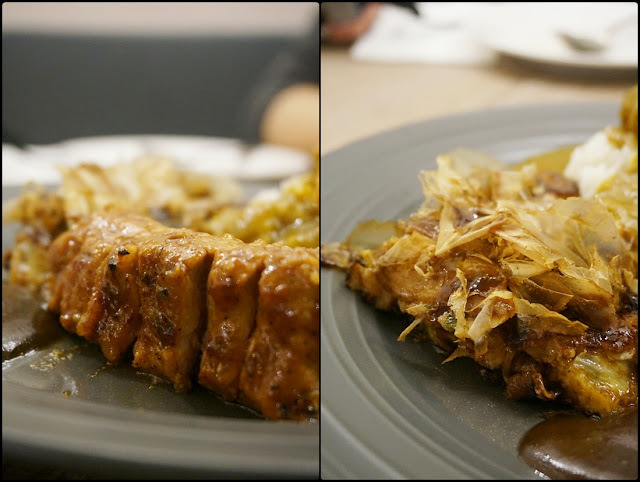 I've heard much about J-Garden serves one of the best Pork Ribs in Penang and finally I got a chance to try it now. This is their signature Grilled Lamb Chop. It was sliced thinly and perfectly grilled with their homemade BBQ sauce to keep their meat tender and juicy. The food we had for the night. I'm a big appetite person I know. Picture shown are their BBQ Pork Ribs and Okonomiyaki, one of Japanese delicacies. The pork ribs is really one of the best I've ever had. And we were told that they chef would soak those pork ribs over night to keep it moisture and the meat absorbed enough of water. And during the grilling process, the meat wouldn't dry up as what BBQ usually did to the meats. We were also served with some delicious Japan delicacies like Doroyaki. You wouldn't be a stranger to this delicacy if you are a fan of Doraemon cartoon. Fruit Salad, and some cakes behind it. Their Tiramisu has a strong taste of alcohol and rather creamy, I really like the strong flavour of Mascarpone cheese in it that made the cake creamy and savory. The dessert platter that special served. It is normally available on the a la carte menu. I really want to highly recommended this dessert to everybody. Their Chocolate Larva Cake would be one of the best larva cake I've ever had. The moment you cut the cake and the hot warm chocolate flow out is one of the most happiest moment I've met, and the rich dark chocolate taste was simply rich and delicious. The J-Garden team of staff dressed up as ghosts during the event to celebrate the event. I would really wanna go back to the restaurant soon as I can really feel the staffs' friendliness and they are pretty helpful. You will feel so welcomed by the staffs. Address: 62, 32, Persiaran Bayan Indah, 11900 Bayan Lepas, Pulau Pinang, Malaysia.